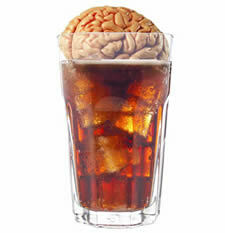 Fructose and Glucose Elicit Opposite Responses in the Human Brain. I’ve had an ongoing disagreement with the National Corn Growers Association for years as to whether high fructose corn syrup reacts differently in the human brain and body than glucose. They’ve written letters to the editor of papers I write for and sent me e-mails trying to convince me, and readers of my columns, that my anecdotal information and scientific sources are incorrect. Recently, Oregon Health Services University (OHSU.edu) published a paper stating, “This study provides evidence in humans that fructose and glucose elicit opposite responses in the brain. It supports the animal research that shows similar findings and links fructose with obesity.”” Jonathan Purnell, M.D.